Hard boil eggs with 1 teaspoon of vinegar in the water. Place dying ingredients in non aluminum pans, cover with water and boil 5 minutes to an hour or when desired intensity is reached, stirring and crushing the ingredients to disperse the color. Strain the coloring ingredients out of the water. While the dye is still hot, place the eggs in and let set in the dye until desired intensity is achieved. Some dyes act faster than others. 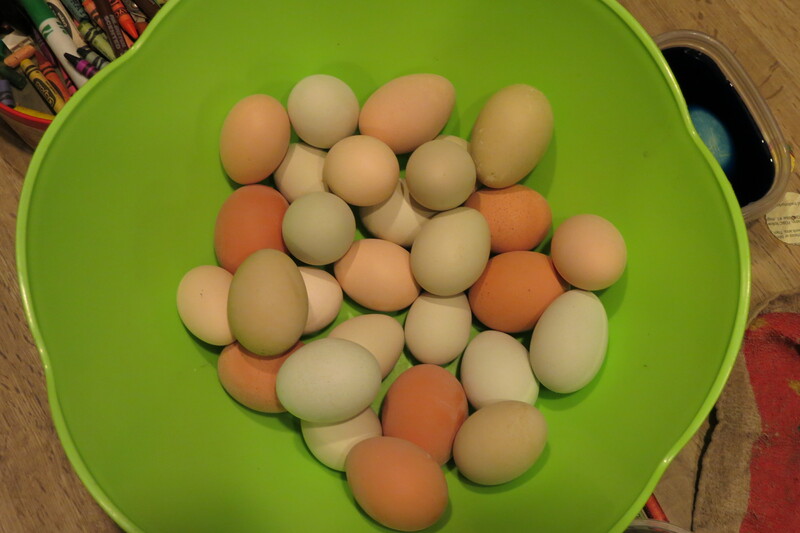 Or, just go to your local farmer and buy a mixed variety of farm fresh eggs like these. These eggs are lovely, indeed!